Some think the Toyota Prius is the anti-car—a jellybean-shaped, slow, boring hatchback that does nothing to further car culture. 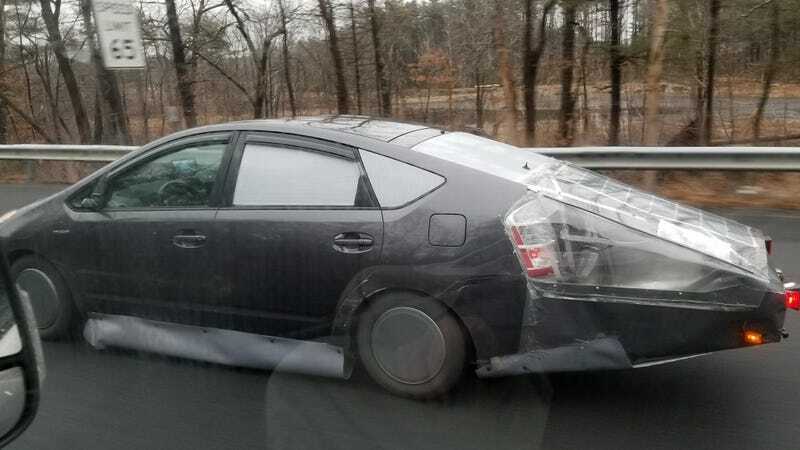 But those people would be wrong, because this highly-modified second-gen spotted in Massachusetts proves that the Prius is a vehicle to be respected by all. Check out these sweet aero mods! That fairing appears to be built with some kind of metal frame that hangs off the tail end of the Prius, and is wrapped in plastic. New lights have been attached to the rear of the fairing, there’s a hose coming off the back of it (I’m not entirely sure what that’s for), and there looks to be a flexible solar panel on top. Also, apparently missing is the Prius’ rear wiper and its antenna—both common mods in the hypermiling community. The thing just looks incredible driving down the road, and I’m curious to see what kind of fuel economy it managed on this trip. When most folks think of true enthusiast cars, they imagine vehicles that can be modified to accelerate faster, handle better, or traverse harsher off-road terrain. But with a Prius, many owners make modifications with the sole aim of improving fuel economy. It’s practical, it looks like a whole lot of fun, and it’s fascinating, making the Prius a real enthusiast’s choice. Yes, the Prius is, without a doubt, an enthusiast’s car.